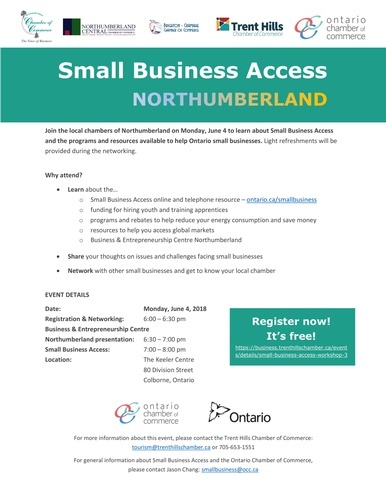 Join Chamber's Northumberland on Monday, June 4 to learn about Small Business Access and the programs and resources available to help Ontario small businesses. For more information about this event, please contact the Trent Hills Chamber of Commerce: tourism@trenthillschamber.ca or 705-653-1551. Network with other small businesses and get to know your local chambers. No fee to attend, pre-registration required.